I want to study aeronautical engineering.now i completed 10th standard.which is the better university to study aeronautical engineering?how much mark should i obtain in 10th and 12th to study aeronautical engineering?how much fees i want to pay to study aeronautical engineering?if it is surity to get job? If it is a valuable study? Minimum marks required in 10th and 12th to get admission into Aeronautical Engineering? Can I study Diploma Aeronautical course with 80% in 10th? Can I study Aeronautical Engineering after completion of Diploma in Computer Engineering? Can I study B.Tech(Aeronautical Engineering) if secured 73% in 12th and 70% in 10th? Fee structure for Aeronautical Engineering course? Qualification required to study Diploma in Aeronautical Engineering for 10th student? Can I study Aeronautical Engineering in Abroad being a B.Sc(PCM) graduate? Total fee expenses to study this course? How can I study Diploma in Aeronautical Engineering after completing 10th? Total fee expenses to study Aeronautical Engineering Diploma course? Re: Which is a better university to study Aeronautical Engineering? Marks required in 10th and 12th to study Aeronautical Engineering? How much is the fee structure? Aeronautical Engineering is just another trade of the Engineering course. So, as is with any other stream, you have to get minimum 60% of marks to apply for engineering courses in standard colleges. That is a prerequisite. Specific colleges may also have their own admission criteria. General examinations are AIEEE, IITJEE, MUOET, BITSAT, etc. i have 1 QUE. i'm studying in diploma mechanical eng. in gandhinagar gujrat. how the process of doing aeronautical eng. ? which have marks in eng.? can u provide last 5 years question papers for science stream?it will students to grasp things quickly. I completed MSc in microbiology can i study aeronautical engineering? i want to study in aeronautical engg. i am studying 10th standarard.what mark should i take in 10th and 12th.please read my request and reply me. 1.>Aeronautical Engineering course or Aviation Engineering course is one of the most popular courses in engineering. 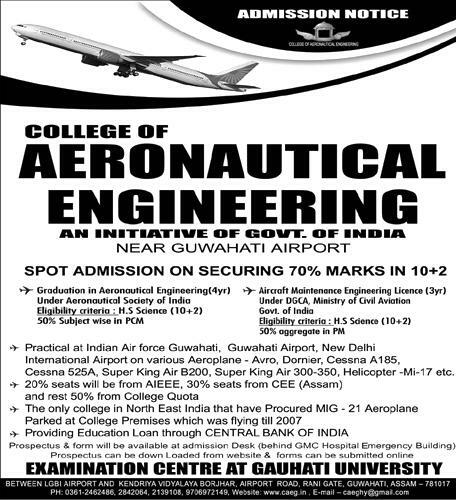 2.> There are several institutes that offer aeronautical engineering courses in India. Candidates who fulfill all the eligibility criteria get a chance to pursue their higher studies in these institutes. 3.> Career training in aeronautical engineering can get you your dream job in a prestigious organization. 1.>For B.E. or B.Tech Course in Aeronautical Engineering in India, you should pass the 10+2 th standard with Physics, Chemistry and Mathematics. 2.>you must qualify in the Joint Entrance Examinations (J.E.E.) conducted by the IIT's. pleaz tell me.......what is the aeronoticl engeeniring???????? Are the admissions in institute of aeronautical engeneering depends on the rank in EAMCET OR AIEEE.........please cold you help me in this...is it compulsory of attending the AIEEE or EAMCET entrance exam.........plz could u send me reply as soon as possible. i have passed my 10th class in CBSE in karnataka and after 12th i wish to join Anna university for B.Tech in aeronautical engineering, please let me know the qualification required and procedure to follow for a student outside tamilnadu to join Anna university. i want 2 join aeronautical engineering college.. I completed my 12th in commerce..so i eligable for studying dis college? What its fees structure? Its sure 2 get job? How many years 2 complete dis cource? how much fee for doing aeronotic engineering? i want to study aeronautical engineering after 10th. can u guide me in knowing the details..
which institutes offers this course and what is the entrance exam for that.. please mail me the details..? the best engineering college sir please give me a clear information about it. Per in 10th what rdquirment in next step? whether aeronautical engineering in Nehru college is possible by counseling...? How to get admission in diploma aeronautical engineering ? how many colleges provide dip.in A.E in tamil nadu?how many marks obtained in 10 std.what is the fees structure? i am completed in d.civil engineering. but i want study BE Aeronautical .is it possible?.please reply me. ranking of Indraprath institute of aironautical eng. GURGOAN in India ?about iiagurgoan? i got 8.8 in 10 how much should i get in 12 to qualify for aeronautical eng? I am in 11th now. Just now i gave exam of cbse board 10th and scored 92 % . I want to do Aeronautical Engineering what are the steps i should follow for doing thi and can you tell me the fee structure of it....? sir,how much marks required in 10th and 12th for study of aeronautical engineering.i got 80percent marks in 10th and i give 12th exam in may.i want to do aeronautical engineering what are the steps i should follow for doing this and sir plz tell me the fee structure of it and about test also. i wont become a aeronautical engineering ,how?